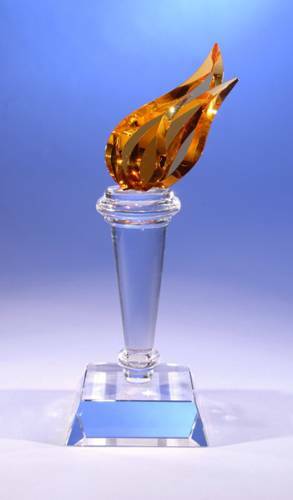 Reminiscent of the Olympic flame, "Torch" is a recent addition to the CRYSTAL WORLD Awards collection. Stunningly crafted, with a generous base for etching, this beautiful award will make an ideal recognition or incentive award, corporate or executive gift. "Torch" is handcrafted from the world's finest, full-cut optical crystal. 4 3/8" x 3 1/2" x 10 3/4"
Etch area: 3" x 1" on base.